Punk Legend Marky Ramone Gabba Gabbas! In his Band of Bruddahs, Marky Ramone’s primary role was that of drummer, the pounding heartbeat and engine of so many of the legendary punk rock group’s numbers. But over many years in meetings, rehearsals, recording studios, concert stages, and countless miles on the road in their trustworthy van, he also had another occupation: constant mediator between his lead singer and guitarist. Acrimony had always been thick between Joey and Johnny Ramone, as the pair were on opposite of ends of the spectrum in politics, temperament, hygiene, and punctuality. Not to mention musical direction. Oh, and Joey’s girlfriend also left him for Johnny. The couple later married. So Joey and Johnny Ramone had not spoken a word directly to each other in nearly 15 years. And when they needed to communicate with each other, they did it – through Marky. Joey turned back around, and radio silence continued. A chance slipped by, never to return. Johnny would not even bring himself to call his bandmate of 22 years as Joey was dying from lymphoma. Johnny himself would later succumb to cancer. 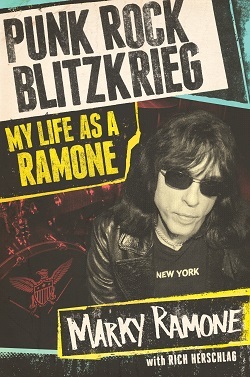 This story – and many others about the punk rock pioneers – get told in Marky Ramone’s memoir written with Rich Herschlag, Punk Rock Blitzkrieg – My Life as a Ramone (416 pp., Touchstone, $28). The man born Marc Bell was not the band’s original drummer who laid down the template for the band’s sound, but joined on the fourth album, Road to Ruin. He spent 15 years with the group (not including a hiatus after being fired for alcoholism), and played roughly 1700 of the band’s 2,263 gigs. Even after the very last show the Ramones ever played in 1996, Marky writes how the band’s interrelations remained frosty, with the band simply leaving the stage and drifting off. Thankfully, the Ramones left a large catalogue of albums behind for fans to discover or rediscover. With Joey, Johnny, bassist Dee Dee, and original drummer Tommy now dead, Marky is (with apologies to later members Richie and C.J.) the last Ramone who was inducted into the Rock and Roll Hall of Fame standing. Yet, the band is today more popular and known than they were at any other time in their actual career. Their songs like “Blitzkrieg Bop,” “I Wanna Be Sedated,” “Beat on the Brat” and “Rock and Roll High School” appear on soundtracks and in TV commercials. Bands like Pearl Jam, Soundgarden, Motorhead, Green Day, and Rancid have sung their praises. And 14-year-old girls – who Marky says may or may not actually own a Ramones record – wear their T-shirts bought from the local mall. “It’s nice to see your band’s name on people’s chests!” he says. Marky has continued to play Ramones music with different musicians. Marky’s weekly radio show, “Punk Rock Blitzkrieg” on Sirius XM’s Faction channel is also going into its tenth year of airing. In the book, Marky also relates tales of his upbringing as well as his stints in other groups. Prior to joining the Ramones in 1978 (four years after their founding), Marky had played drums for early hard rock power trio Dust, the gender-bending Wayne County and the Backstreet Boys, and punk rockers Richard Hell and the Voidoids. It was while on a tour of England with that last group on a bill with the Clash that Marky saw the difference between U.S. and U.K. punk music. Problems of a different sort were apparent in 1982. For while Dee Dee and Joey had substance abuse issues of their own, Marky’s drinking got him booted from the band. It ended up being a blessing in disguise, albeit a leather-jacketed one. “I was a periodic drinker, but it was starting to get to me. When Joey told me it was time to leave the band and get some help, it was the best phone call anybody ever made to me,” Marky says. After taking a series of odd jobs including bicycle messenger and construction demolition worker, a sober Marky was asked to rejoin the Ramones and 1987 and stayed with them until the end, and has not touched a drink since. So it’s with some head scratching that one of his latest business ventures (he already has a line of marinara sauce) is a…beer. One whose natural brown ale “rich in flavor and aroma” has never made it to its namesake’s own stomach. He adds that some of the proceeds from the beer will go to the group Musicians Without Borders, and other monies from sale of the sauce are earmarked for the charity Autism Speaks. 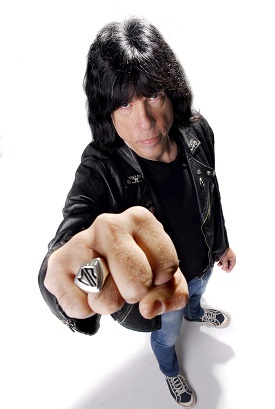 For more on Marky Ramone, visit his website. 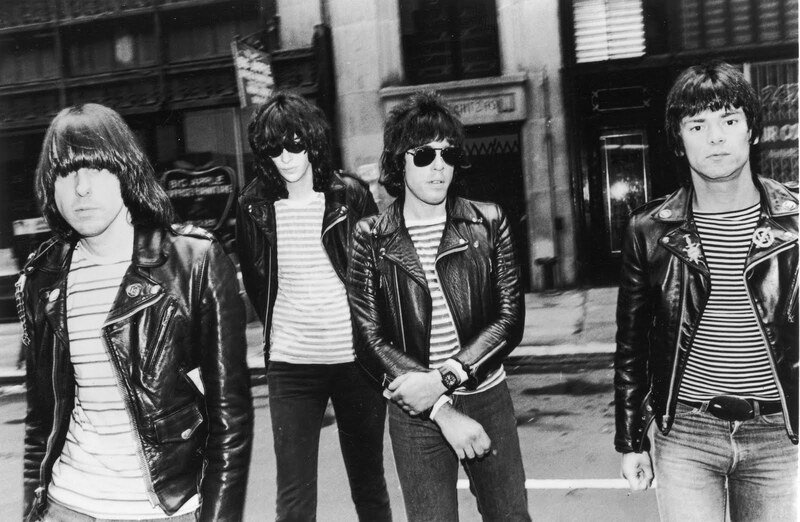 This entry was posted in Punk, Ramones, Uncategorized and tagged Dee Dee Ramone, Joey Ramone, Johnny Ramone, Marky Ramone, The Ramones, Tommy Ramone. Bookmark the permalink.